A Texas-based research team will begin clinical trials on an experimental treatment for the Ebola virus. ZMapp, the monoclonal antibody combination therapy that was used to treat humans during the 2014 West Africa Ebola outbreak before even reaching human clinical trials, will be further researched by the Texas Biomedical Research Institute in San Antonio. The institute was granted a $2 million contract by Mapp Biopharmaceutical — the makers of ZMapp — to test the therapy in primate models with a well-characterized form of the virus. 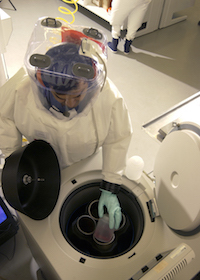 Study leader Ricardo Carrion, Jr., PhD, Associate Scientist and Associate Director of the facility’s Biosafety Level 4 laboratory, told MD Magazine the virus is a well-characterized make from what was seen in the 2014 Ebola outbreak. In its use during the outbreak, ZMapp was administered to 7 patients infected with Ebola. Five patients survived the infection, while 2 died. Despite previous Ebola outbreaks causing mortality rates as high as 90%, the investigative therapy’s efficacy was not considered statistically significant. It was also tested in its first randomized, controlled trial as an accompanying therapy to standard care (oral favipiravir) versus monotherapy favipiravir in humans infected with a virus strain diagnosed in West Africa by polymerase-chain-reaction-assay. Seventy-one patients, from sites in Liberia, Sierra Leone, Guinea, and the United States were randomized 1:1 to receive either therapy regimen. The patients administered ZMapp were given 50 mg per kilogram of their body weight, administered once every 3 days. The primary endpoint was mortality at 28 days from baseline. Of the 36 patients to receive ZMapp plus standard care, 8 (22%) died from the virus, while 13 of the 35 (37%) patients to receive lone standard care died. Researchers noted the posterior probability that ZMapp plus standard care was clinically superior was 91.2% — short of the 97.5% threshold. They also found that baseline viral load was a strong predictor for both mortality and hospitalization length in all treatment and age groups. ZMapp functions as a combination of 3 humanized antibodies produced in genetically-modified tobacco plants that target 3 Ebola glycoprotein epitopes. If it proves efficacious and safe in animal models, it could be on track to become the first Ebola treatment approved by the US Food and Drug Administration (FDA). The study will begin in either October or November of this year, Carrion said. Though it’s not part of their contracted duties, the researchers and Mapp Biopharmaceutical will also consider more efficient means of drug manufacturing and distribution, in response to the epidemic threat. ZMapp’s eventual approval would give it the opportunity to join the Strategic National Stockpile, among other repository vaccines, therapies, and other public health countermeasures. “We look forward to teaming with Mapp Bio to perform pivotal studies that will transition ZMapp towards FDA licensure,” Carrion said in a statement.